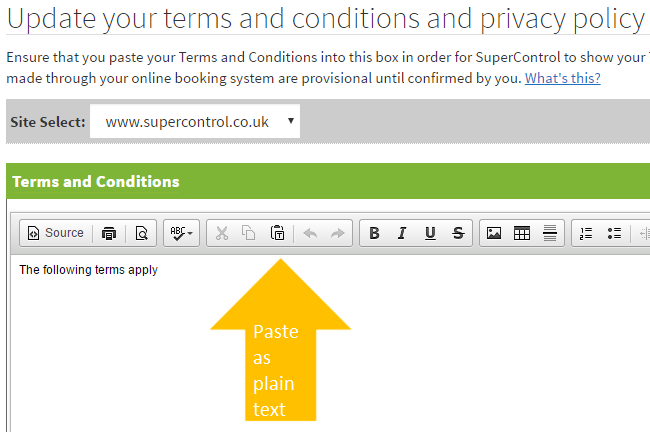 Help CentreUsing SuperControl Setting upHow do I add my terms and conditions? Note: If copying/pasting you should always use the "Paste as plain text" area. This will remove any bad coding that may be transferred from another programme. It is important that you include a clause in your Terms and Conditions to clarify that bookings made through the online booking system are provisional until confirmed. A contract shall only arise when your booking is subsequently confirmed in writing via a letter of confirmation sent to you by email or post. If you have a Cancellation Policy in your Terms and Conditions, make sure to cover what happens to any monies already taken. You should specify how and when the guest needs to contact you regarding loss of deposit, part or full payment. Prev: How do I change my password? Next: How do I add my existing bookings?